The A* (pronounced A-star) algorithm can be complicated for beginners. While there are many articles on the web that explain A*, most are written for people who understand the basics already. This article is for the true beginner. This article does not try to be the definitive work on the subject. Instead it describes the fundamentals and prepares you to go out and read all of those other materials and understand what they are talking about. Links to some of the best are provided at the end of this article, under Further Reading. Finally, this article is not program-specific. You should be able to adapt what's here to any computer language. As you might expect, however, I have included a link to a sample program at the end of this article. The sample package contains two versions: one in C++ and one in Blitz Basic. It also contains executables if you just want to see A* in action. Let's assume that we have someone who wants to get from point A to point B. Let's assume that a wall separates the two points. 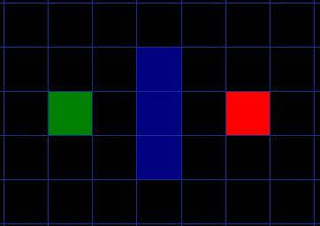 This is illustrated below, with green being the starting point A, and red being the ending point B, and the blue filled squares being the wall in between. The first thing you should notice is that we have divided our search area into a square grid. Simplifying the search area, as we have done here, is the first step in pathfinding. This particular method reduces our search area to a simple two dimensional array. Each item in the array represents one of the squares on the grid, and its status is recorded as walkable or unwalkable. The path is found by figuring out which squares we should take to get from A to B. Once the path is found, our person moves from the center of one square to the center of the next until the target is reached. These center points are called "nodes". When you read about pathfinding elsewhere, you will often see people discussing nodes. Why not just call them squares? Because it is possible to divide up your pathfinding area into something other than squares. They could be rectangles, hexagons, triangles, or any shape, really. And the nodes could be placed anywhere within the shapes – in the center or along the edges, or anywhere else. We are using this system, however, because it is the simplest. Once we have simplified our search area into a manageable number of nodes, as we have done with the grid layout above, the next step is to conduct a search to find the shortest path. We do this by starting at point A, checking the adjacent squares, and generally searching outward until we find our target. Begin at the starting point A and add it to an "open list" of squares to be considered. The open list is kind of like a shopping list. Right now there is just one item on the list, but we will have more later. It contains squares that might fall along the path you want to take, but maybe not. Basically, this is a list of squares that need to be checked out. Look at all the reachable or walkable squares adjacent to the starting point, ignoring squares with walls, water, or other illegal terrain. Add them to the open list, too. For each of these squares, save point A as its "parent square". This parent square stuff is important when we want to trace our path. It will be explained more later. Drop the starting square A from your open list, and add it to a "closed list" of squares that you don't need to look at again for now. At this point, you should have something like the following illustration. In this illustration, the dark green square in the center is your starting square. It is outlined in light blue to indicate that the square has been added to the closed list. All of the adjacent squares are now on the open list of squares to be checked, and they are outlined in light green. Each has a gray pointer that points back to its parent, which is the starting square. Next, we choose one of the adjacent squares on the open list and more or less repeat the earlier process, as described below. But which square do we choose? The one with the lowest F cost. H = the estimated movement cost to move from that given square on the grid to the final destination, point B. This is often referred to as the heuristic, which can be a bit confusing. The reason why it is called that is because it is a guess. We really don't know the actual distance until we find the path, because all sorts of things can be in the way (walls, water, etc.). You are given one way to calculate H in this tutorial, but there are many others that you can find in other articles on the web. 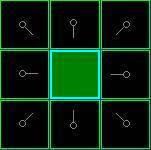 Our path is generated by repeatedly going through our open list and choosing the square with the lowest F score. This process will be described in more detail a bit further in the article. First let's look more closely at how we calculate the equation. As described above, G is the movement cost to move from the starting point to the given square using the path generated to get there. In this example, we will assign a cost of 10 to each horizontal or vertical square moved, and a cost of 14 for a diagonal move. We use these numbers because the actual distance to move diagonally is the square root of 2 (don't be scared), or roughly 1.414 times the cost of moving horizontally or vertically. We use 10 and 14 for simplicity's sake. The ratio is about right, and we avoid having to calculate square roots and we avoid decimals. This isn't just because we are dumb and don't like math. Using whole numbers like these is a lot faster for the computer, too. As you will soon find out, pathfinding can be very slow if you don't use short cuts like these. Since we are calculating the G cost along a specific path to a given square, the way to figure out the G cost of that square is to take the G cost of its parent, and then add 10 or 14 depending on whether it is diagonal or orthogonal (non-diagonal) from that parent square. The need for this method will become apparent a little further on in this example, as we get more than one square away from the starting square. H can be estimated in a variety of ways. The method we use here is called the Manhattan method, where you calculate the total number of squares moved horizontally and vertically to reach the target square from the current square, ignoring diagonal movement, and ignoring any obstacles that may be in the way. We then multiply the total by 10, our cost for moving one square horizontally or vertically. This is (probably) called the Manhattan method because it is like calculating the number of city blocks from one place to another, where you can't cut across the block diagonally. Reading this description, you might guess that the heuristic is merely a rough estimate of the remaining distance between the current square and the target "as the crow flies." This isn't the case. We are actually trying to estimate the remaining distance along the path (which is usually farther). The closer our estimate is to the actual remaining distance, the faster the algorithm will be. If we overestimate this distance, however, it is not guaranteed to give us the shortest path. In such cases, we have what is called an "inadmissible heuristic." Technically, in this example, the Manhattan method is inadmissible because it slightly overestimates the remaining distance. But we will use it anyway because it is a lot easier to understand for our purposes, and because it is only a slight overestimation. On the rare occasion when the resulting path is not the shortest possible, it will be nearly as short. Want to know more? You can find equations and additional notes on heuristics here. F is calculated by adding G and H. The results of the first step in our search can be seen in the illustration below. The F, G, and H scores are written in each square. As is indicated in the square to the immediate right of the starting square, F is printed in the top left, G is printed in the bottom left, and H is printed in the bottom right. So let's look at some of these squares. In the square with the letters in it, G = 10. This is because it is just one square from the starting square in a horizontal direction. The squares immediately above, below, and to the left of the starting square all have the same G score of 10. The diagonal squares have G scores of 14. The H scores are calculated by estimating the Manhattan distance to the red target square, moving only horizontally and vertically and ignoring the wall that is in the way. Using this method, the square to the immediate right of the start is 3 squares from the red square, for a H score of 30. The square just above this square is 4 squares away (remember, only move horizontally and vertically) for an H score of 40. You can probably see how the H scores are calculated for the other squares. The F score for each square, again, is simply calculated by adding G and H together. Drop it from the open list and add it to the closed list. Check all of the adjacent squares. Ignoring those that are on the closed list or unwalkable (terrain with walls, water, or other illegal terrain), add squares to the open list if they are not on the open list already. Make the selected square the "parent" of the new squares. If an adjacent square is already on the open list, check to see if this path to that square is a better one. In other words, check to see if the G score for that square is lower if we use the current square to get there. If not, don't do anything. On the other hand, if the G cost of the new path is lower, change the parent of the adjacent square to the selected square (in the diagram above, change the direction of the pointer to point at the selected square). Finally, recalculate both the F and G scores of that square. If this seems confusing, you will see it illustrated below. Okay, so let's see how this works. Of our initial 9 squares, we have 8 left on the open list after the starting square was switched to the closed list. Of these, the one with the lowest F cost is the one to the immediate right of the starting square, with an F score of 40. So we select this square as our next square. It is highlight in blue in the following illustration. First, we drop it from our open list and add it to our closed list (that's why it's now highlighted in blue). Then we check the adjacent squares. Well, the ones to the immediate right of this square are wall squares, so we ignore those. The one to the immediate left is the starting square. That's on the closed list, so we ignore that, too. The other four squares are already on the open list, so we need to check if the paths to those squares are any better using this square to get there, using G scores as our point of reference. Let's look at the square right above our selected square. Its current G score is 14. If we instead went through the current square to get there, the G score would be equal to 20 (10, which is the G score to get to the current square, plus 10 more to go vertically to the one just above it). A G score of 20 is higher than 14, so this is not a better path. That should make sense if you look at the diagram. It's more direct to get to that square from the starting square by simply moving one square diagonally to get there, rather than moving horizontally one square, and then vertically one square. When we repeat this process for all 4 of the adjacent squares already on the open list, we find that none of the paths are improved by going through the current square, so we don't change anything. So now that we looked at all of the adjacent squares, we are done with this square, and ready to move to the next square. So let's choose the one just below, and to the right of the starting square, as is shown in the following illustration. That leaves five other squares. The other two squares below the current square aren't already on the open list, so we add them and the current square becomes their parent. Of the other three squares, two are already on the closed list (the starting square, and the one just above the current square, both highlighted in blue in the diagram), so we ignore them. And the last square, to the immediate left of the current square, is checked to see if the G score is any lower if you go through the current square to get there. No dice. So we're done and ready to check the next square on our open list. We repeat this process until we add the target square to the closed list, at which point it looks something like the illustration below. Note that the parent square for the square two squares below the starting square has changed from the previous illustration. Before it had a G score of 28 and pointed back to the square above it and to the right. Now it has a score of 20 and points to the square just above it. This happened somewhere along the way on our search, where the G score was checked and it turned out to be lower using a new path – so the parent was switched and the G and F scores were recalculated. While this change doesn't seem too important in this example, there are plenty of possible situations where this constant checking will make all the difference in determining the best path to your target. So how do we determine the path? Simple, just start at the red target square, and work backwards moving from one square to its parent, following the arrows. This will eventually take you back to the starting square, and that's your path. It should look like the following illustration. Moving from the starting square A to the destination square B is simply a matter of moving from the center of each square (the node) to the center of the next square on the path, until you reach the target. Add the starting square (or node) to the open list. a) Look for the lowest F cost square on the open list. We refer to this as the current square. b) Switch it to the closed list. If it is not walkable or if it is on the closed list, ignore it. Otherwise do the following. If it isn't on the open list, add it to the open list. Make the current square the parent of this square. Record the F, G, and H costs of the square. If it is on the open list already, check to see if this path to that square is better, using G cost as the measure. A lower G cost means that this is a better path. If so, change the parent of the square to the current square, and recalculate the G and F scores of the square. If you are keeping your open list sorted by F score, you may need to resort the list to account for the change. Fail to find the target square, and the open list is empty. In this case, there is no path. Save the path. Working backwards from the target square, go from each square to its parent square until you reach the starting square. That is your path. Note: In earlier versions of this article, it was suggested that you can stop when the target square (or node) has been added to the open list, rather than the closed list. Doing this will be faster and it will almost always give you the shortest path, but not always. Situations where doing this could make a difference are when the movement cost to move from the second to the last node to the last (target) node can vary significantly -- as in the case of a river crossing between two nodes, for example. Forgive me for digressing, but it is worth pointing out that when you read various discussions of A* pathfinding on the web and in assorted forums, you will occasionally see someone refer to certain code as A* when it isn't. For the A* method to be used, you need to include the elements just discussed above -- specifically open and closed lists and path scoring using F, G, and H. There are lots of other pathfinding algorithms, but those other methods are not A*, which is generally considered to be the best of the lot. Bryan Stout discusses many of them in the article referenced at the end of this article, including some of their pros and cons. Sometimes alternatives are better under certain circumstances, but you should understand what you are getting into. Okay, enough ranting. Back to the article. Now that you understand the basic method, here are some additional things to think about when you are writing your own program. Some of the following materials reference the program I wrote in C++ and Blitz Basic, but the points are equally valid in other languages. 1. Other Units (collision avoidance): If you happen to look closely at my example code, you will notice that it completely ignores other units on the screen. The units pass right through each other. Depending on the game, this may be acceptable or it may not. If you want to consider other units in the pathfinding algorithm and have them move around one another, I suggest that you only consider units that are either stopped or adjacent to the pathfinding unit at the time the path is calculated, treating their current locations as unwalkable. For adjacent units that are moving, you can discourage collisions by penalizing nodes that lie along their respective paths, thereby encouraging the pathfinding unit to find an alternate route (described more under #2). If you choose to consider other units that are moving and not adjacent to the pathfinding unit, you will need to develop a method for predicting where they will be at any given point in time so that they can be dodged properly. Otherwise you will probably end up with strange paths where units zig-zag to avoid other units that aren't there anymore. You will also, of course, need to develop some collision detection code because no matter how good the path is at the time it is calculated, things can change over time. When a collision occurs a unit must either calculate a new path or, if the other unit is moving and it is not a head-on collision, wait for the other unit to step out of the way before proceeding with the current path. 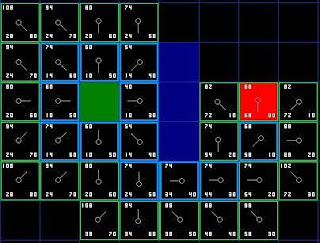 Steering Behavior for Autonomous Characters: Craig Reynold's work on steering is a bit different from pathfinding, but it can be integrated with pathfinding to make a more complete movement and collision avoidance system. The Long and Short of Steering in Computer Games: An interesting survey of the literature on steering and pathfinding. This is a pdf file. Coordinated Unit Movement: First in a two-part series of articles on formation and group-based movement by Age of Empires designer Dave Pottinger. Implementing Coordinated Movement: Second in Dave Pottinger's two-part series. 2. Variable Terrain Cost: In this tutorial and my accompanying program, terrain is just one of two things – walkable or unwalkable. But what if you have terrain that is walkable, but at a higher movement cost? Swamps, hills, stairs in a dungeon, etc. – these are all examples of terrain that is walkable, but at a higher cost than flat, open ground. Similarly, a road might have a lower movement cost than the surrounding terrain. This problem is easily handled by adding the terrain cost in when you are calculating the G cost of any given node. Simply add a bonus cost to such nodes. The A* pathfinding algorithm is already written to find the lowest cost path and should handle this easily. In the simple example I described, when terrain is only walkable or unwalkable, A* will look for the shortest, most direct path. But in a variable-cost terrain environment, the least cost path might involve traveling a longer distance – like taking a road around a swamp rather than plowing straight through it. An interesting additional consideration is something the professionals call "influence mapping." Just as with the variable terrain costs described above, you could create an additional point system and apply it to paths for AI purposes. Imagine that you have a map with a bunch of units defending a pass through a mountain region. Every time the computer sends somebody on a path through that pass, it gets whacked. If you wanted, you could create an influence map that penalized nodes where lots of carnage is taking place. This would teach the computer to favor safer paths, and help it avoid dumb situations where it keeps sending troops through a particular path, just because it is shorter (but also more dangerous). Yet another possible use is penalizing nodes that lie along the paths of nearby moving units. One of the downsides of A* is that when a group of units all try to find paths to a similar location, there is usually a significant amount of overlap, as one or more units try to take the same or similar routes to their destinations. Adding a penalty to nodes already 'claimed' by other units will help ensure a degree of separation, and reduce collisions. Don't treat such nodes as unwalkable, however, because you still want multiple units to be able to squeeze through tight passageways in single file, if necessary. Also, you should only penalize the paths of units that are near the pathfinding unit, not all paths, or you will get strange dodging behavior as units avoid paths of units that are nowhere near them at the time. Also, you should only penalize path nodes that lie along the current and future portion of a path, not previous path nodes that have already been visited and left behind. 3. Handling Unexplored Areas: Have you ever played a PC game where the computer always knows exactly what path to take, even though the map hasn't been explored yet? Depending upon the game, pathfinding that is too good can be unrealistic. Fortunately, this is a problem that is can be handled fairly easily. The answer is to create a separate "knownWalkability" array for each of the various players and computer opponents (each player, not each unit -- that would require a lot more computer memory). Each array would contain information about the areas that the player has explored, with the rest of the map assumed to be walkable until proven otherwise. Using this approach, units will wander down dead ends and make similar wrong choices until they have learned their way around. Once the map is explored, however, pathfinding would work normally. 4. Smoother Paths: While A* will automatically give you the shortest, lowest cost path, it won't automatically give you the smoothest looking path. Take a look at the final path calculated in our example (in Figure 7). On that path, the very first step is below, and to the right of the starting square. Wouldn't our path be smoother if the first step was instead the square directly below the starting square? There are several ways to address this problem. While you are calculating the path you could penalize nodes where there is a change of direction, adding a penalty to their G scores. Alternatively, you could run through your path after it is calculated, looking for places where choosing an adjacent node would give you a path that looks better. 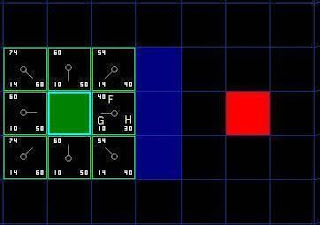 For more on the whole issue, check out Toward More Realistic Pathfinding, a (free, but registration required) article at Gamasutra.com by Marco Pinter. 5. Non-square Search Areas: In our example, we used a simple 2D square layout. You don't need to use this approach. You could use irregularly shaped areas. Think of the board game Risk, and the countries in that game. You could devise a pathfinding scenario for a game like that. To do this, you would need to create a table for storing which countries are adjacent to which, and a G cost associated with moving from one country to the next. You would also need to come up with a method for estimating H. Everything else would be handled the same as in the above example. Instead of using adjacent squares, you would simply look up the adjacent countries in the table when adding new items to your open list. Similarly, you could create a waypoint system for paths on a fixed terrain map. Waypoints are commonly traversed points on a path, perhaps on a road or key tunnel in a dungeon. As the game designer, you could pre-assign these waypoints. Two waypoints would be considered "adjacent" to one another if there were no obstacles on the direct line path between them. As in the Risk example, you would save this adjacency information in a lookup table of some kind and use it when generating your new open list items. You would then record the associated G costs (perhaps by using the direct line distance between the nodes) and H costs (perhaps using a direct line distance from the node to the goal). Everything else would proceed as usual. Amit Patel has written a brief article delving into some alternatives. For another example of searching on an isometric RPG map using a non-square search area, check out my article Two-Tiered A* Pathfinding. Consider a smaller map or fewer units. Never do path finding for more than a few units at a time. Instead put them in a queue and spread them out over several game cycles. If your game is running at, say, 40 cycles per second, no one will ever notice. But they will notice if the game seems to slow down every once in a while when a bunch of units are all calculating paths at the same time. Consider using larger squares (or whatever shape you are using) for your map. This reduces the total number of nodes searched to find the path. If you are ambitious, you can devise two or more pathfinding systems that are used in different situations, depending upon the length of the path. This is what the professionals do, using large areas for long paths, and then switching to finer searches using smaller squares/areas when you get close to the target. If you are interested in this concept, check out my article Two-Tiered A* Pathfinding. For longer paths, consider devising precalculated paths that are hardwired into the game. Consider pre-processing your map to figure out what areas are inaccessible from the rest of the map. I call these areas "islands." In reality, they can be islands or any other area that is otherwise walled off and inaccessible. One of the downsides of A* is that if you tell it to look for paths to such areas, it will search the whole map, stopping only when every accessible square/node has been processed through the open and closed lists. That can waste a lot of CPU time. It can be prevented by predetermining which areas are inaccessible (via a flood-fill or similar routine), recording that information in an array of some kind, and then checking it before beginning a path search. In a crowded, maze-like environment, consider tagging nodes that don't lead anywhere as dead ends. Such areas can be manually pre-designated in your map editor or, if you are ambitious, you could develop an algorithm to identify such areas automatically. Any collection of nodes in a given dead end area could be given a unique identifying number. 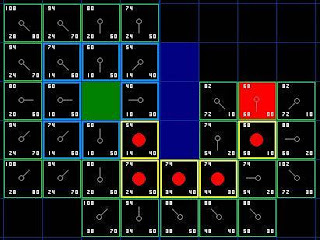 Then you could safely ignore all dead ends when pathfinding, pausing only to consider nodes in a dead end area if the starting location or destination happen to be in the particular dead end area in question. 7. Maintaining the Open List: This is actually one of the most time consuming elements of the A* pathfinding algorithm. Every time you access the open list, you need to find the square that has the lowest F cost. There are several ways you could do this. You could save the path items as needed, and simply go through the whole list each time you need to find the lowest F cost square. This is simple, but really slow for long paths. This can be improved by maintaining a sorted list and simply grabbing the first item off the list every time you need the lowest F-cost square. When I wrote my program, this was the first method I used. This will work reasonably well for small maps, but it isn't the fastest solution. Serious A* programmers who want real speed use something called a binary heap, and this is what I use in my code. In my experience, this approach will be at least 2-3 times as fast in most situations, and geometrically faster (10+ times as fast) on longer paths. If you are motivated to find out more about binary heaps, check out my article, Using Binary Heaps in A* Pathfinding. Another possible bottleneck is the way you clear and maintain your data structures between pathfinding calls. I personally prefer to store everything in arrays. While nodes can be generated, recorded and maintained in a dynamic, object-oriented manner, I find that the amount of time needed to create and delete such objects adds an extra, unnecessary level of overhead that slows things down. If you use arrays, however, you will need to clean things up between calls. The last thing you will want to do in such cases is spend time zero-ing everything out after a pathfinding call, especially if you have a large map. I avoid this overhead by creating a 2d array called whichList(x,y) that designates each node on my map as either on the open list or closed list. After pathfinding attempts, I do not zero out this array. Instead I reset the values of onClosedList and onOpenList in every pathfinding call, incrementing both by +5 or something similar on each path finding attempt. This way, the algorithm can safely ignore as garbage any data left over from previous pathfinding attempts. I also store values like F, G and H costs in arrays. In this case, I simply write over any pre-existing values and don't bother clearing the arrays when I'm done. Storing data in multiple arrays consumes more memory, though, so there is a trade off. Ultimately, you should use whatever method you are most comfortable with. 8. Dijkstra's Algorithm: While A* is generally considered to be the best pathfinding algorithm (see rant above), there is at least one other algorithm that has its uses - Dijkstra's algorithm. Dijkstra's is essentially the same as A*, except there is no heuristic (H is always 0). Because it has no heuristic, it searches by expanding out equally in every direction. As you might imagine, because of this Dijkstra's usually ends up exploring a much larger area before the target is found. This generally makes it slower than A*. So why use it? Sometimes we don't know where our target destination is. Say you have a resource-gathering unit that needs to go get some resources of some kind. It may know where several resource areas are, but it wants to go to the closest one. Here, Dijkstra's is better than A* because we don't know which one is closest. Our only alternative is to repeatedly use A* to find the distance to each one, and then choose that path. There are probably countless similar situations where we know the kind of location we might be searching for, want to find the closest one, but not know where it is or which one might be closest.